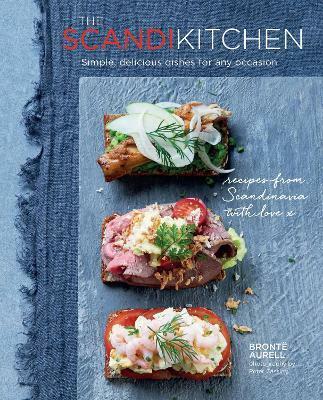 This accessible and entertaining introduction to Scandinavian food contains over 80 recipes to try at home, developed by Bronte Aurell, owner of the popular ScandiKitchen Cafe in LondonÃ¢â‚¬â„¢s bustling West End. ThereÃ¢â‚¬â„¢s so much more to Nordic food than pickled herring and meatballs. Stretching from the midnight sun of northern Norway to the flat, fertile fields of Denmark, Scandinavian food culture is a lot more varied than you might think. Dishes and ingredients link all the regions together, bringing a uniquely Nordic food experience to life that was created by thousands of years of heritage and shared culture. Scandinavian food is simple. Natives call it Ã¢â‚¬ËœhusmanskostÃ¢â‚¬â„¢ (farmerÃ¢â‚¬â„¢s fare). ItÃ¢â‚¬â„¢s natural and honest. When you work with the very best produce, thereÃ¢â‚¬â„¢s no need to overcomplicate it. Its appeal lies in the fact that it is healthy, wholesome, flavorsome, simple to make and beautiful to look at. This book features recipes for all occasions and times of the day, ranging from morning buns, lunchtime savories, hearty dinners, and indulgent desserts, to bakes and other foods for special celebrations. Enjoy fresh and simple open sandwiches, healthy Nordic salads, delicious traditional hot dishes, and indulgent cakes. Discover new flavors and textures from mustard pickled herring and gravlax to sticky Kladdkaka cake.